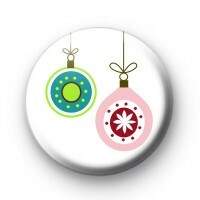 2 Festive Baubles Badge which is really contemporary and cute. This is a bright white badge with two colourful Christmas baubles. One bauble is green and the other is pink and red. These cute Christmas badges are hand made in our UK workshop. Standard 25mm button badge. We have a great range of over 600 Christmas badges so be sure to check them out. My halloween badges are wicked. i dont want to give any away now...i want to keep them all myself.